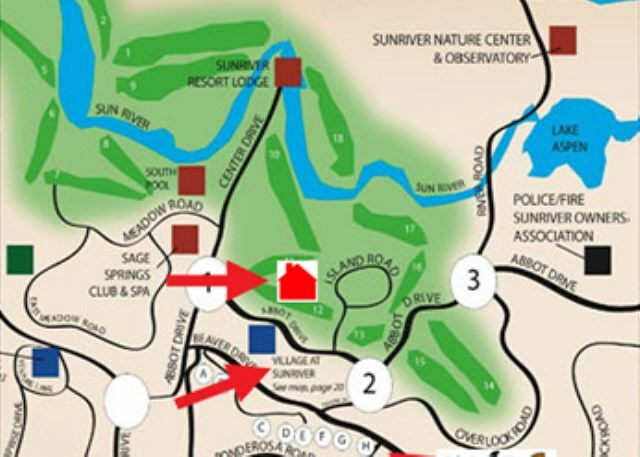 Located On The 12th Tee Of Meadows Golf Course, 10 Unlimited SHARC Passes! 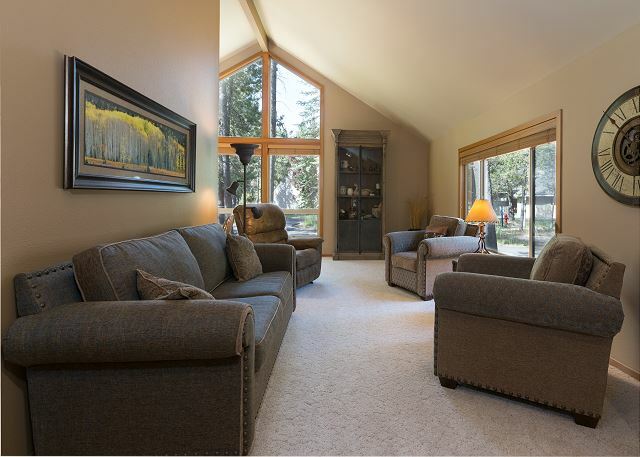 An outstanding Sunriver retreat begins in this 4 bedroom, 3 bath with Loft. 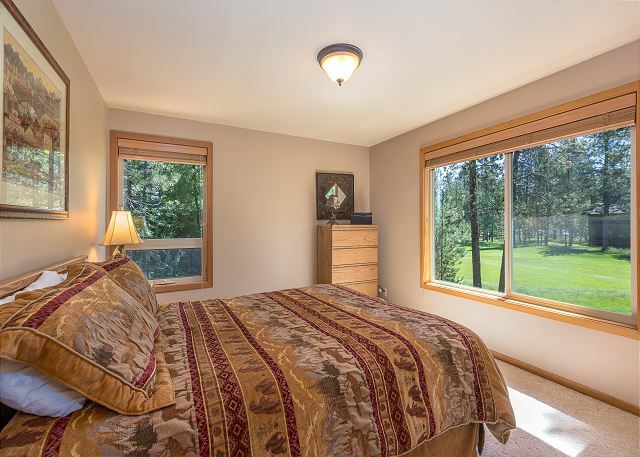 This is a great vacation home located on the 12th tee of the Meadows Golf Course with easy walking or bicycling to the Village Mall, Sunriver Lodge and SHARC Aquatic & Recreation Facility. 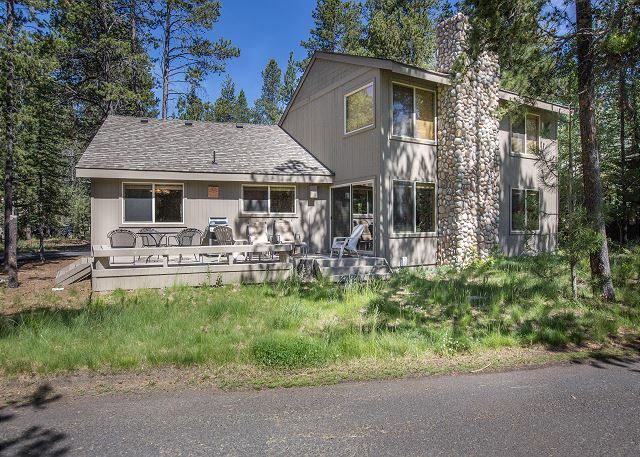 Stay in the heart of Sunriver and utilize the 7 bikes that are included in this home to explore Central Oregon’s prime resort area. Sunriver has over 30 miles of paved bike paths and is only a short drive to Mt. Bachelor! 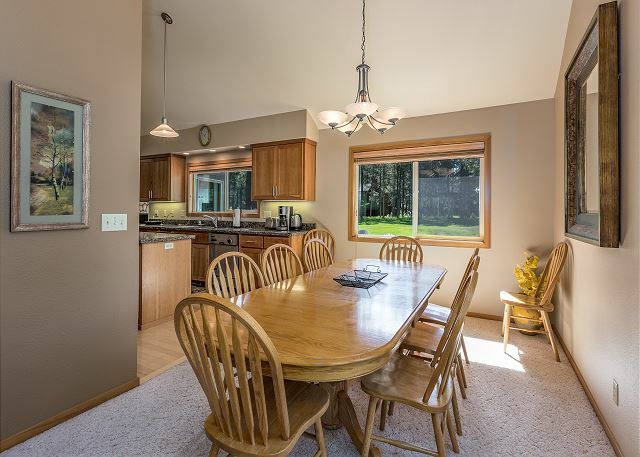 Make a feast in this beautiful, fully stocked kitchen adorned with granite counter tops and stainless steel appliances, enjoy sitting down and discussing the day with family and friends at the dining room table that seats 10 while eating your meal. 2 Augusta Lane has both a living room and a family room, the family room has a gas fireplace and large HD TV! 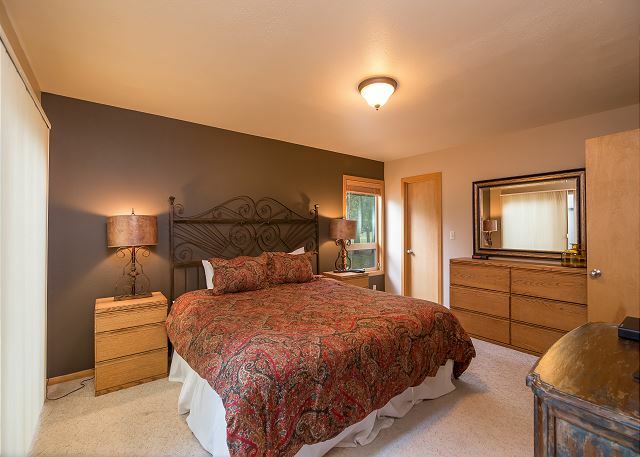 The upstairs loft room has a sofa sleeper, a full bath, and two large bedrooms. 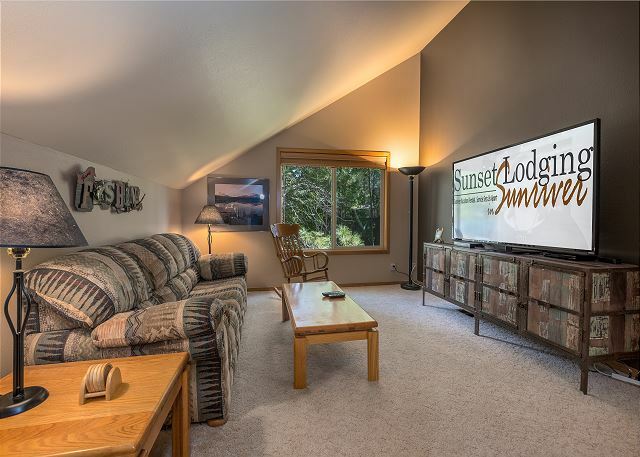 After a day of fun in Sunriver the loft room is perfect to kick back and watch a movie on the 70" HD TV! This home is the perfect place for a multi family getaway! This home features a large deck that is 375 sq ft and a gas BBQ! Make sure the whole family goes on vacation with you, this includes your dog. This home is dog friendly, no cats please as the owners are highly allergic to them. 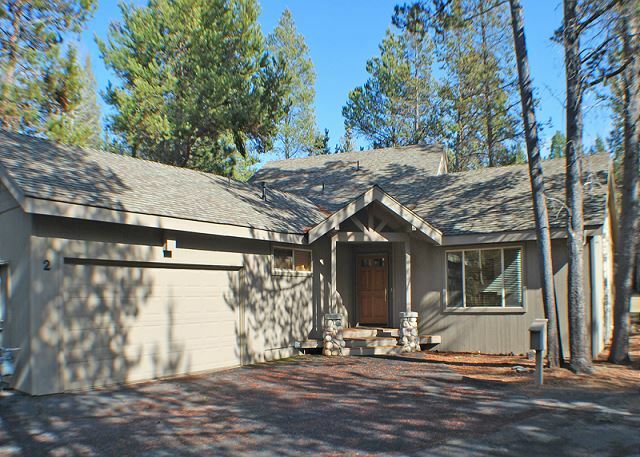 This home offers Free WIFI and 10 Unlimited SHARC passes, free tennis and free access to the Sunriver Marina. 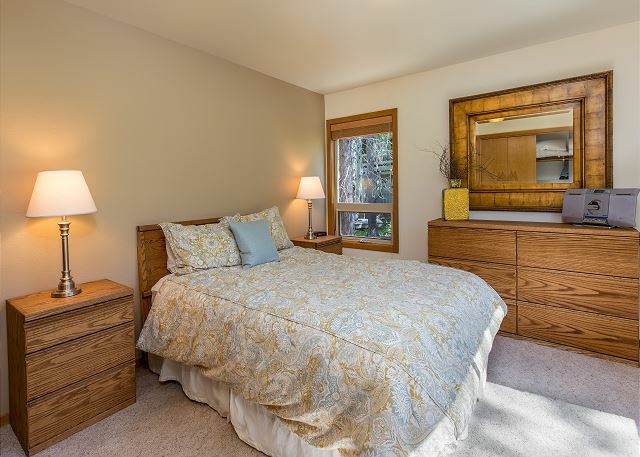 When you think of coming to Sunriver we hope 2 Augusta Lane comes to mind, this home has been beautifully renovated with in the last five years and pride of ownership is reflected. very good overall, we needed some plastic glasses and dishes to accommodate grandchildren. Thank You for the 5 star review, Barbara! So glad you had a good family getaway with us, we hope to see you again soon! Nice house but no hot tub! The room layout was nice. Kitchen had nice pans but the dishwasher handle was broken. OVerall a thumbs up. Thank You for your review, Marilee! Glad to hear that you enjoyed the layout at this home and the Kitchenware and give it a thumb's UP! Come back soon! We had an excellent time here at Augusta 2. The ONLY thing we would want someone coming in the middle of July to know is that there is NO A/C. We happened to arrive during one of the hottest weeks of the year. Had we had a heads up on the lack of A/C, we would have planned accordingly. Other than that, the accommodations were gorgeous, great location & lots of fun bikes and things to do. Would highly recommend this property in a cooler month! Thank You for the 5 star Review, Erika! We are so glad that you enjoyed the home and had an excellent time! Come back soon! This house is very comfortable, spacious and excellent location to the Village, Lodge, bike paths, Sharc, and tennis. We enjoyed cooking in the up-to-date kitchen. Looking forward to coming back soon. Thank You for the 5 star review, Joseph! 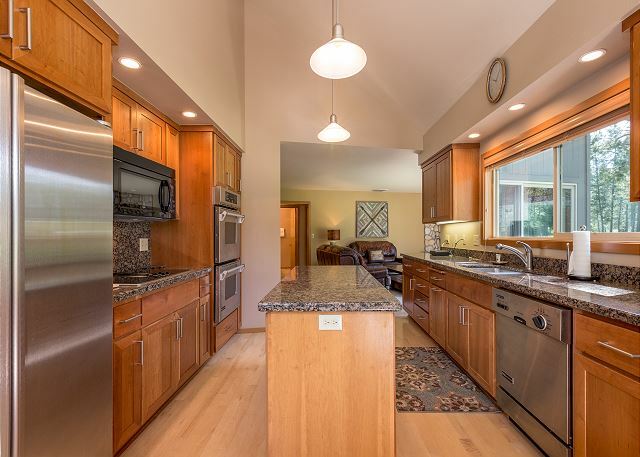 We love to hear when our guests are able to take advantage of all Sunriver has to offer, and that kitchen is WONDERFUL, isn't it? Hope to see you again soon! We had a wonderful time in the home. Fully stocked and excellent locations. Thank you for choosing to spend your Christmas vacation with us in Sunriver. 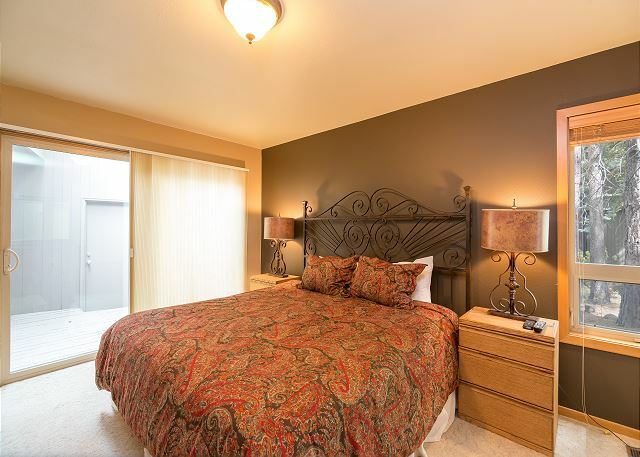 We're glad you enjoyed your time in the home at Augusta 2 and look forward to welcoming you back to Sunriver soon! The pictures don't do this house justice! This was a very nice house and the location is perfect. Close to the mall and Sharc. The free Sharc passes are an added value and make this the perfect house to stay in. It was clean and we found everything in good working order. Thank you for sharing your great house with us! Wow Bria! Thanks so much for the review! WE are so happy that you had a great stay in Sunriver and hope you come visit us again real soon. Another great stay at Augusta 2 for the 2017 Pacific Crest Endurance Sports Festival. We value this home for its great location for the festival. Grandsons enjoyed access to SHARC and bike riding on Sunriver's extensive trails. 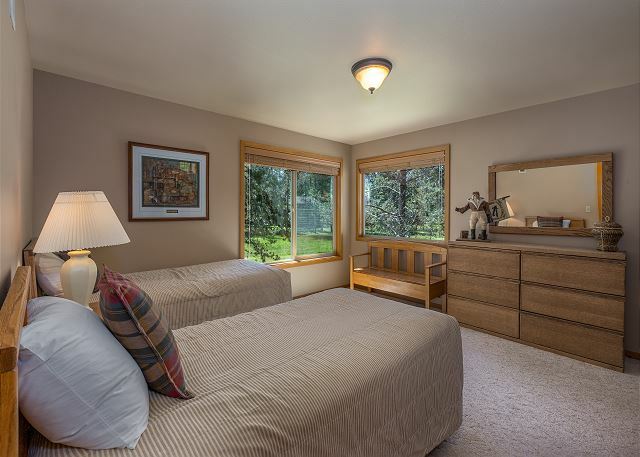 Augusta 2 is comfortable and well-suited for our annual Sunriver mini-family reunion. Thanks so much for the great review Roy. We are thrilled that you enjoyed your stay. Pacific Crest Weekend is always a BLAST! Augusta #2 was an excellent rental for the seven people who stayed in the home. Beverages on the deck facing #12 tee of the Meadows course was super and conversing with fellow golfers as they completed their tee shots was entertaining. 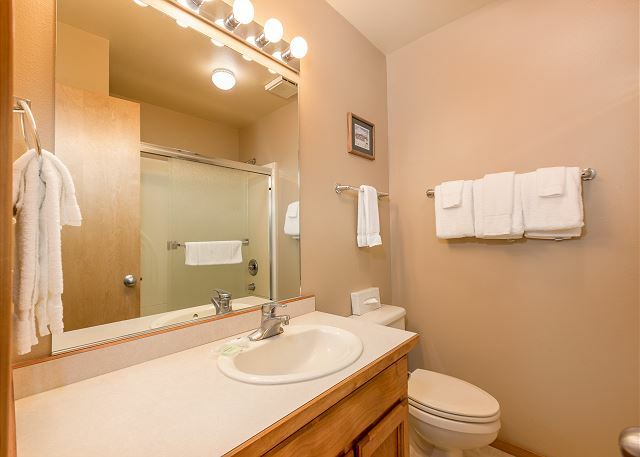 The house is well supplied with all the kitchen amenities and entertainment systems. The beds were all super comfortable and the dining area provided great comfort in entertaining numerous dinners. All the things we want to hear going on at the homes, Dennis! People watching on the Tee is kinda fun, no? Great golf here in Sunriver and PERfect house for it. We hope to see you back here soon, and thanks for being treasured guests at Augusta 2! We spent the week with family and friends from all over the country coming in for our son's wedding and Augusta 2 was the perfect location for all activities. This is the second time we have stayed here in this home and we love it! A golf ball through the upstairs window was the only negative. FORE!!! Sorry about that, Janet. 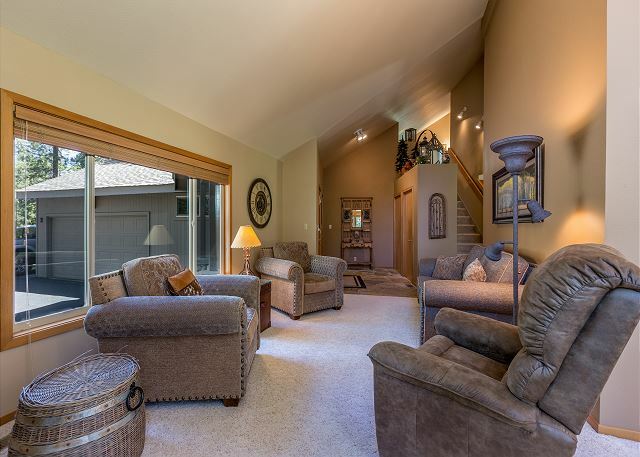 Augusta 2 is definitely one of our most popular homes with our golfers, and for good reason. The only drawback, those golfers that shank their drives. We hope to see you back here in Sunriver soon and we are so grateful for the time you've taken to give us your feedback. Great location...across fairway to The Village. House was very comfortable with plenty of amenities. When we ran out of propane, the management sent someone over immediately. Loved the large deck and seating. We spent a lot of time on the deck and enjoyed watching the golfers and the deer. We have already booked for a week next August. We are SO GLAD you are coming back, Cheryl! We hope to get the privilege to host you for many years to come. We really enjoyed our stay. The home was clean, comfortable and well equipped. We especially enjoyed the location of the home, being so close to the Village and SHARK. Would absolutely recommend. Awesome!! Thank you Dave, we hope you will get back to Augusta 2 and Sunriver soon! The House was very nice, we enjoyed staying ther, however the King Bed needs a new mattress it was like sleeping on coils, the Hidabed also needs a new mattress. Other then that we had a nice weekend. This was the first year we stayed in this house- our family has been coming to Sunriver for almost 30 years for Christmas. We have stayed in nine different homes and this was by far our favorite! 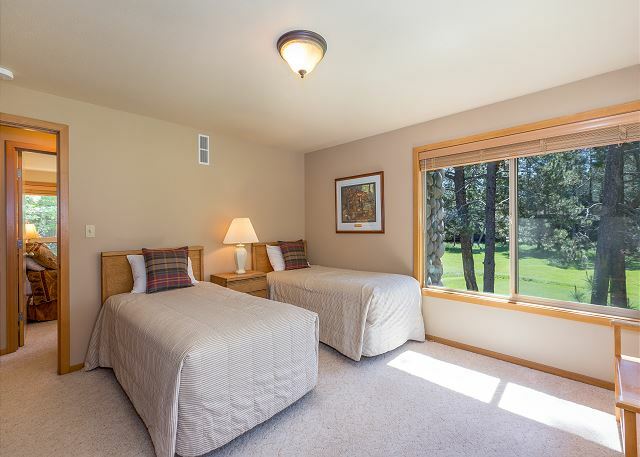 The location was close to the mall and a short walk to the lodge, the furnishings were comfortable, the exposure to the golf course was beautiful and the home offered plenty of room for all 8 of us to have our own space. A winner!! This is a great home for a small family with young kids. It is on a very quiet street with lots of loops for the kids to ride their bikes safely. It is a very close bike ride or walk to either the Village of SHARC. The house is sufficiently equipped but, other than the kitchen, quite dated in decor. It is well maintained and mostly clean (as long as they clean the carpets, which were quite awful during our stay). Please notice that there is NO A/C. We didn't realize this when we booked, but it gets quite hot, especially upstairs. They have fans in every room to help pull in the cool night air. Thank you for this feedback, Mel! We are very glad to hear that the fans did their job in this fierce heat. 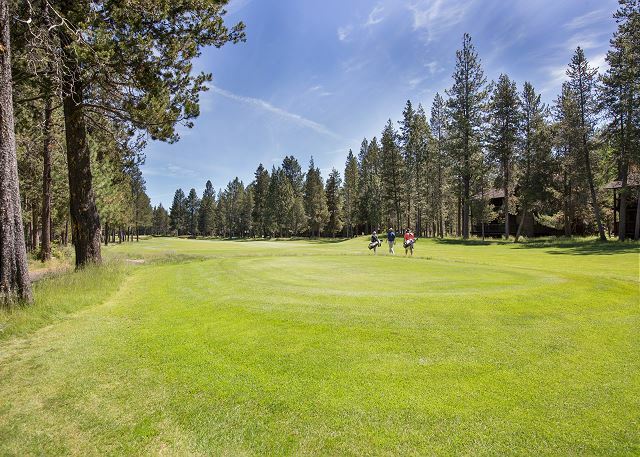 We've had a highly unusual summer here in Sunriver with the heat and lack of snow pack to keep things cool during our warmer months. We'll pass your observations on decor along to the owners when we meet in the fall and will have the carpets cleaned as well. Your reservation, like many others, was a back-to-back reservation, so we were unable to steam clean the carpets prior to your arrival without causing an infringement on your visit. We hope you'll come back to Augusta 2 and Sunriver soon. 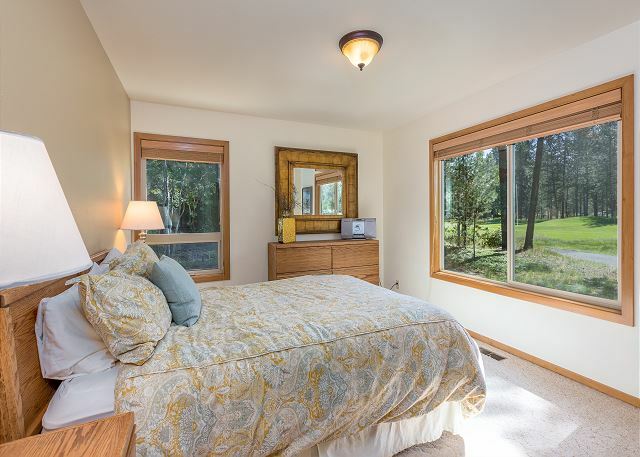 2 Augusta Lane is a very comfortable home, close to Sunriver Village Mall and SHARC. Daily temperatures were in the high 90s, so the upstairs bedrooms were quite warm overnight. The house was clean and in good condition. This heat is really something else. Totally unusual for our breezy little mountain town. Glad you enjoyed yourselves anyway, Roy. Perhaps you'd be interested in the cooler weather in September? (that's only 2 months away!) 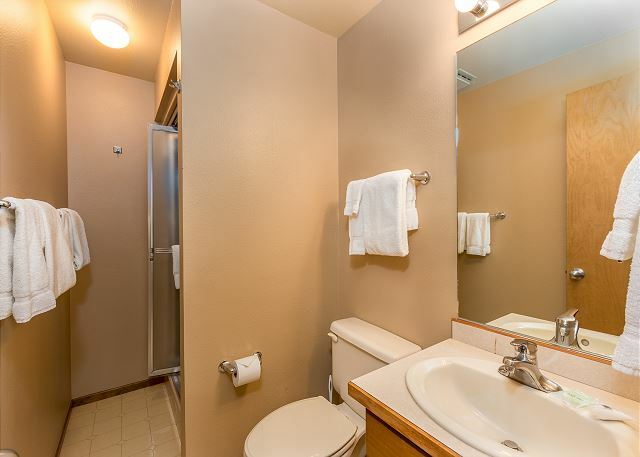 Whenever it is, we'll have your home away from home ready. We stayed in this lovely home for a few days over spring break. The location is great as we were able to walk to the village and it gave our teenagers a chance to be independent as they could go back and forth by themselves. The house has everything you could want, beautiful decorated and clean with plenty of space for everyone to do their own thing. One thing I would say is that the internet switched off around 9pm every night which didn't please our teenagers! But overall we had a wonderful experience at this home and would definitely stay here again! 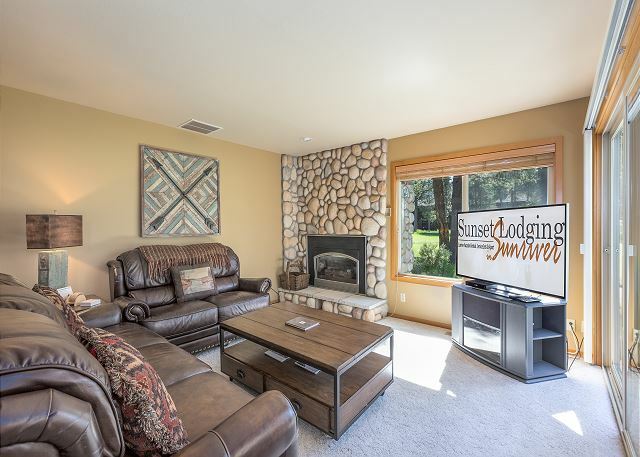 We've booked our sunriver trips with Sunset lodging for many years and have always been pleased with the homes and the quality of service we've received! We love having you come back each year, Marina! I will do some digging on the internet issue. Thanks for letting us know! We hope to see you again soon!